I got up this morning, ate my oatmeal and cinnamon roll, and then headed over to downtown Greenville for the metric century ride I have been training for. I didn’t know what to expect. Two questions were on my mind: 1) how would I do riding in a large group, and 2) how would I do climbing Paris Mountain after riding for 50 miles? When I got there I ran into two guys I knew, Miles and Matthew. One is a senior in college and the other is in his first year of law school. So, they were about 15 years younger than I am. Both are pretty good cyclist. The only thing in my favor is that Matthew had been in Mexico much of the summer and hadn’t riden in awhile. My first question was answered in a positive way. Riding in the group really helped to take some of the load off. Drafting was a big help. Also, Miles and Matthew really challenged me and where I would normally slow because I wasn’t feeling like I would like, I kept going so I could hang with them. The only negative about the group aspect came shortly after we passed our second SAG. The next eventful thing brings us to question two. Paris Mountain. I turned left onto Altamont Rd. with Miles and Matthew. We were the only three in this group. Miles pretty much off and left us. He actually seemed to have fun climbing that hill. Matthew and I put it as small rings and “walked” it up. However, we made it! We even passed a couple of riders on the way. We made it, but on the way down the other side, I was toast. I couldn’t get my legs to do anything. I wanted to get in the upper ring so I could fly! But I couldn’t even pedalling downhill was a chore. So, I just coasted as much as I could until I got to the bottom. Once there, I stopped and answered some questions for a guy who was from out of town. As I pulled away from him, I came to a stop sign and had to stop. I didn’t get my shoe out of the pedal fast enough and down I went! I didn’t even get a scrape, but I did bend my front brake lever a little. Nothing big. The good news is that I got another adrenelin rush at that point and the problems I had with my legs went away. The three of us took it on in from there without further incident. Now, I think I’ll take a break from those kind of rides for awhile! 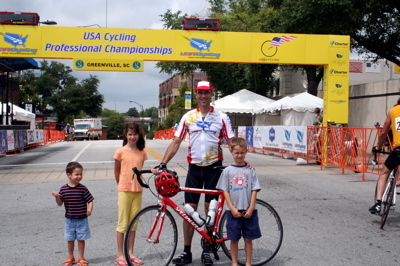 This entry was posted in Events, Rides and tagged Metric Century, Palmetto Peloton Project on September 2, 2006 by Jonathan Pait.